TVS students work on their bike at the the DP&L’s and The Ohio Energy Projects “Activating and Energizing Girls in Science” (AEGIS) Energy Bike Camp. The bike will be presented at a board of education meeting on July 20 and can be seen at the community picnic on Aug. 13. The student who attended the camp will return to school as “Energy Leaders” this fall. WEST ALEXANDRIA —Twin Valley South recently participated in the DP&L’s and The Ohio Energy Project’s “Activating and Energizing Girls in Science” (AEGIS) Energy Bike Camp. 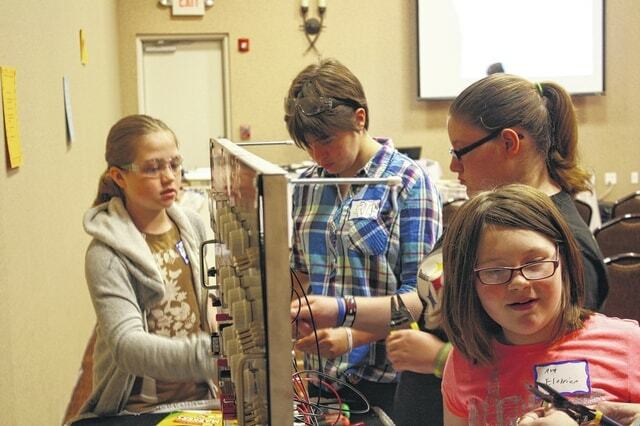 Twin Valley was one of five Dayton-area schools selected to participate in the project. The school sent five students to the event: Erin Tebbe, Hannah Pemberton, Ava Benner, and Alyssa Earich. The five girls represented TVS at the camp. The camp was a three-day event where the team learned to cut, strip and crimp wire, as they followed a wiring schematic to make all of the needed connects to the wire board. The team was creating an energy bike that once ridden, would provide power to the wire board that would light up as the bike was being pedaled. According to Catherine Ackerman, a science teacher at TVS who accompanied the girls on the trip, the group also learned valuable life skills. “The girls also learned valuable leadership and teamwork skills that they will utilize as they return to school this fall as the ‘Energy Bike Experts’ who will be training other teachers on how to use the bike, conduct class programs for their peers, and host outreach events in the community,” Ackerman said. Ackerman was also accompanied by Amy Pemberton, who assisted the girls in their experience. The Energy Bike will be presented by the team to the Twin Valley Community Local Schools Board of Education at a meeting on July 20. They will also be demonstrating the bike along with other energy leaders and energy activities at the annual West Alexandria Community Picnic on Aug. 13.